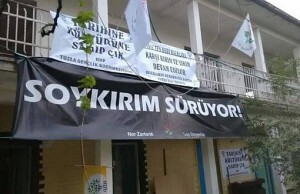 Nor Zartonk made a statement and called out to protect Camp Armen, a former Armenian orphanage in Tuzla district of İstanbul after the attempt of demolition the camp. “We call everyone who supports our mutual past and future to protect Camp Armen. In Nor Artonk’s statement, it was emphasized that Camp Armen, built with the labor of more than 1500 children, was the hope to live together. Camp Armen was the past and the mutual memory of all people’s living in this country. It was stated that Camp Armen was built without state assitance and in spite of all difficulties and oppressions and it was reminded that this demolition process was a part of the extermination policies. “After 1980 coup d’etat, orphanage’s founder and manager Hrant Güzelyan was tortured with the claim he was raising Armenian militant in the orphanage and they closed down the building unlawfully by occupying its territory and left it to rot. Now, they want to demolish it totally. “This is not only a worn-out building left to rot for a long time with mingled bureaucratic process they even didn’t want to handle and this is not only its green surrounding once made by children. “It is a ‘homelike’ orphanage once embraced and was built by the labor of more than 1500 poor and orphan children like an embroidery that they want to demolish now. “It is an orphanage for poor Armenian children grew up in this country whose families and elder ones exposed to genocide or witnessed genocide in which they dealt with their losses and pain and created a new life and hope.